Hi, this is my dark version of the v5 default theme, as we all know it. It is just dark. Initially I made it for my own use, but decided to share it. It has all layouts and full functionality from the original theme, I removed nothing. I used the original graphics and recoloured or rebuilt them. It includes the user editable Flow feature, also in the additional layouts. More information here: Editing the Default 5 Theme. The colors you choose for your tracks are more visible. If you want your project look pastel-color or saturated, it looks more like your chosen colors. But its overall appearance is dark. Latest update: 12/19/2017 => Details in this post. Full ChangeLog is in the download links. The Themes are available via ReaPack. Kudos and all credits go to White Tie and Bernstraw. - the Transport Play/Pause buttons: if stopped, they are "unlit", if on/pause is active, they are "lit"
- a layout named "Standard bottom" for the Transport Bar, which can be useful when you have the Transport Bar docked at the bottom of the main window. This layout adds a little space below the Play Buttons. - a drum toolbar button for the MIDI Editor. If you use the "Named Notes Mode" for drums and want a drum icon there, you can take this one. For download and details of the toolbar icon please go to stash. That's it, I hope you like it! Hey, this is cool!! Thanks for sharing. Location: Great Lakes, N. A. Hey - this is pretty nice. I like it a lot. Thanks. But I found a lil' bug. I have Ed's color toolbar installed. A.) When the mouse pointer crosses a color buttun, I'm getting these little white outlines around the buttons over which the mouse has passed over. B.) This only happens in full-screen mode. I'll still use it though, even if this never gets rectified. Because, well, gosh darn it, I just like it. Last edited by ReaperMadness; 02-09-2016 at 04:17 PM. Thank you, glad you like it! I installed ED's toolbar and I'm sorry, I can't reproduce the bug. I had to match it to german language first and it works. Last edited by Pet; 02-06-2016 at 06:44 AM. 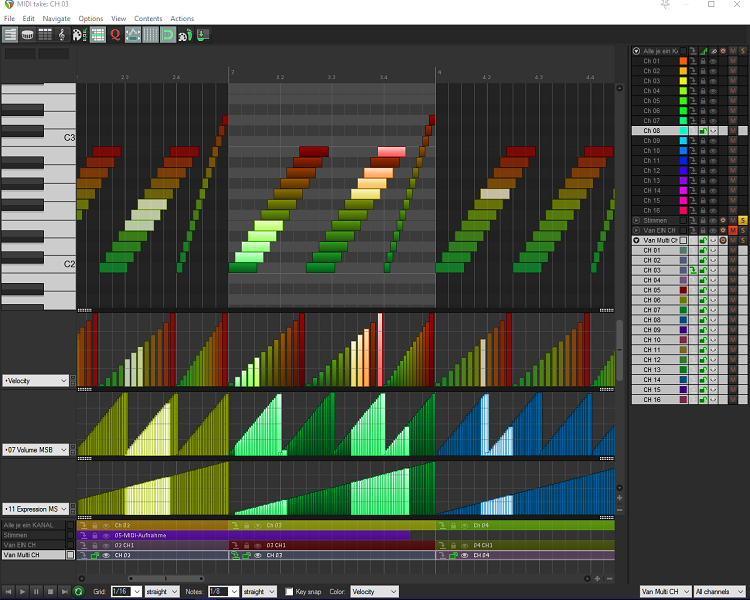 And this is the colormap: https://stash.reaper.fm/v/21749/midi_note_colormap.png . Vitalker, thank you! For my private use, I use the colormap from the Circus theme by hopi (https://stash.reaper.fm/theme/1059/CIRCUS%206.0.rar), but I wanted to keep some things close to the original theme. 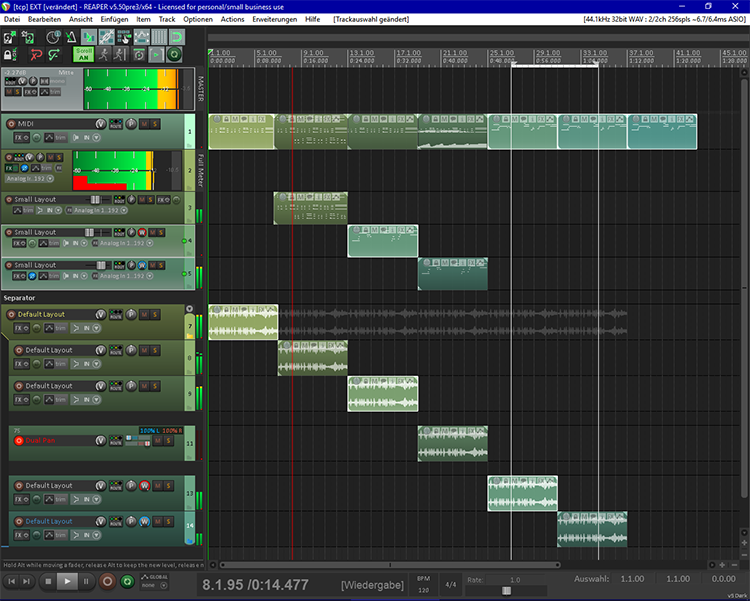 This makes it less insecure for guys who are new to Reaper, if they toggle between the original theme and this one. Absolutely love it - thanks! Is there any way I can get an 'empty space' folder like this... ? Last edited by trevlyns; 03-28-2016 at 05:00 AM. Don't get it... don't care. All is well. There's no bugs like no bugs. Last edited by ReaperMadness; 01-29-2016 at 11:27 AM. Pet, thank you too! I appreciate your warm words! I'm not braging, but my note colourmap is really great for dark themes, maybe it's even the best for this kind of themes. Good! Did you find the reason for that or is it one of the mystic Windows surprises? Last edited by Pet; 02-01-2016 at 03:46 AM. Sorry, what do you mean by "flatted color track"? Last edited by Pet; 12-19-2017 at 12:02 PM. Hey, thanks a lot for sharing this. It looks great in the eyes from the first moment. And since the functionality is the same as the original, i think i will stick to it. And these red and yellow colors in the tracks(mute, solo, etc), they are beautiful. Pet - So... obviously I haven't been paying attention to this thread for awhile. It does the 'funny graphics thing' on any menu at the top of the screen - not just 'Ed's Toolbar'. BUT... it only does it when REAPER is full screen on my 2560 x 1440 monitor; No problem at all full-screen on my 1920 x 1200. It's no big deal, but I know how you guys want to see to it that everything's perfecto. And god luv ya' for it. And thanks for the great work. Really nice theme mod. Last edited by ReaperMadness; 01-07-2017 at 10:48 AM. ReaperMadness - honestly, I don't have any idea where this comes from. I really want to know what happens there. All OK, no graphic issues. I suspected the toolbar buttons first, I also have - like you - some RADO buttons in use without any problems. Awesome job Pet!!! looks awesome!! Love the theme - and I'm currently using it - thank you very much for the hard work! 1) could it be modified where the "gridlines" are a little brighter and more visible? Thanks again for making a great theme !!! I'm glad that you like it and use it! 1) You can modify the gridlines to your taste with the tweak/configuration window and with help of the element finder. You can find them in the actions window. Search for "theme...". Run both of them. In the element finder activate "Highlight selected colors..." and in the "Find color" dropdown menu scroll down to "grid...". The one you choose will then be highlighted with a pink color in the tweaker window. Click that pink bit and choose another color. 2) I do not exactly understand what you mean by that. Are you talking about the highlighting of the selected track in the mixer? This can be done by modifying a png that's packed within the theme itself. Maybe a screenshot could be helpful. I hope I could help you a bit, let me know how it is going. Currently I'm working on this theme again, cause I'm not satisfied at all how I tweaked the meters. Thank you so much for the help!!!!! I started with your advice about the gridlines and using the tweaker / element finder. Once I learned how to use those tools - I figured out how to change the track backgrounds the way I wanted them too. Looking through everything on the list - I just slightly changed the background color of EVEN tracks - and that way they were a little more defined across the screen by being a slightly lighter shade of grey / black. I just wanted a very subtile "striping" effect across the screen where it was easier for my eyes to pick out which track I was on. Again - thank you so much for your help!!! Great theme - great advice - great education about how more stuff works in Reaper !!! You are welcome, I'm glad that you found what you wanted! I was not shure if you meant the mixer or the arrangement window. What I forgot to mention is that you have to save the theme after you made the changes...but I guess you figured that out. As you've seen you can change a lot with that tweak/configuration window. Btw this gives you the possibility to play around with the tweaker and do crazy things with it just for fun and to learn what is what... as long as you don't save it. Close that configuration window without saving and reload the theme and all is back to normal. Last edited by Pet; 12-19-2017 at 12:04 PM. Hello. Would you like to use my colourmap? I confess, I am torn. Your colormap is really cool (I love the gradients) and I tried it the last time you wrote here. There is one thing that makes me hesitate: I am used to the attribute that something I select is more visible than the unselected. This concerns not only the midi editor, this concerns also tracks, items and so on. This is what I am used to, my personal workflow (it's hard to make a "I" better visible to underscore it ). Your colormap is exactly inverted to this (my) habit if I remember correctly. I thought about reverting this but that seemed not that easy (for me) to do. It would take me hours and at the moment I'm a little busy with other things. So this is a way for everyone to use his favorite colormap. Ahahaha. Sorry. Really I wrote to this thread some time ago. Ok. What do you mean by inverted? If you can explain, I'll try to make a new colormap. But that shows your sense is stable. If you want to change that in a new colormap, go ahead! Probably I will use it in my "private" theme . ...but I wanted to keep some things close to the original theme. 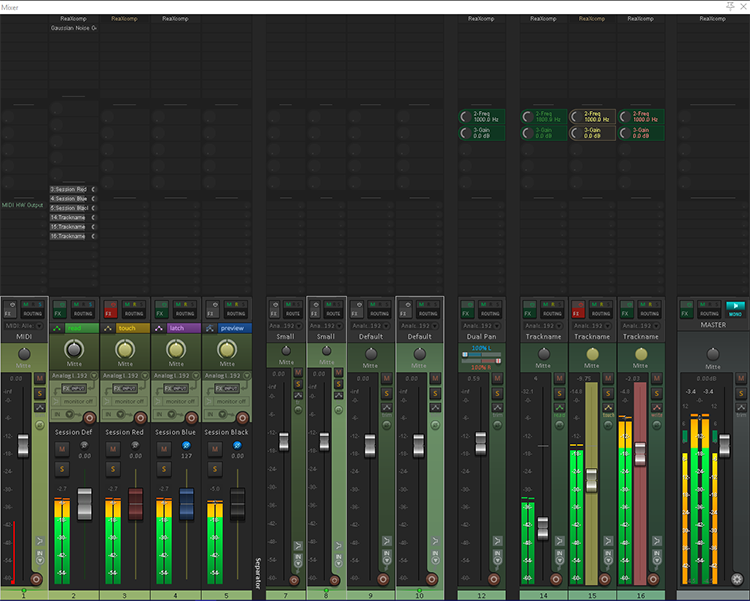 This makes it less insecure for guys who are new to Reaper, if they toggle between the original theme and this one. Ok, got it. You mean selected notes should look like unselected and vice versa? Thank you, will try asap! This is absolutely great. Using it with my win10 dark theme and its all fine, i just changed the vertical bars colors for measures starts, as it was barely visible here. Thank for the effort, hope this will be "maintained" if it needs to be. I am watching if there are changes happening in the default theme and add that. I'm also pondering about making an "extended" version with separators, colored faders and some more layouts, but at the moment I'm alas a little busy with other things. Nice work...My default theme since now! Thank you Danihell, I'm glad you like it! today I uploaded a "new" version with some small color corrections. 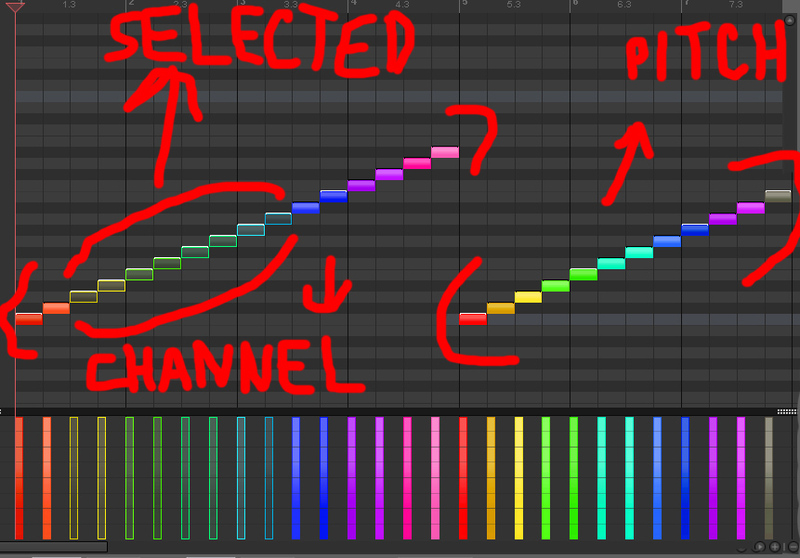 The edit cursor in the MIDI Editor is now colored the same way as in the arrange window. And I made some changes to the tracklist colors in the MIDI Editor. There's a modified midi-note-colormap too. Also made the cursors a bit thicker. Hi geoslake, I appreciate that you still like it. It's the same font as in the default, but I changed the color a tiny little bit. In Preferences => Appearance: try to selected "Faster text rendering (reduces antialiasing). My favorite theme on REAPER. Thank you! I'd love to see a track and mixer panel that's just blank.... no controls or meters. Something to separate sections in the arrangement window and mixer.